As our September class is coming to a close, we are so impressed with how far these students have come! 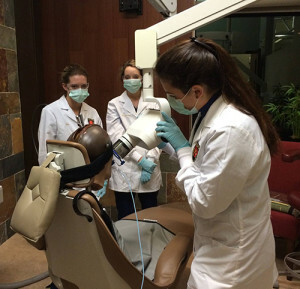 They dove right into the course and set out to become an Elite Dental Assistant! These amazing women worked together to study and learn a new career. They have learned the value of hard work and what it means to selflessly put other’s needs ahead of their own, one of the best qualities of a dental assistant! As their 13 weeks comes to a close (boy that way fast!!! ), we marvel at what an amazing group of women we have come to know, admire and appreciate. 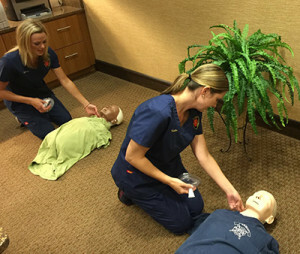 A highlight of the program is the CPR class! If you’ve ever taken a class where the teacher is throwing out different “choking” or “lack of breathing” scenarios, you’ll understand the feeling of jumping for joy because you think you’ve revived that dummy only to see it’s found something else to choke on before you can finally pass the test!! There is no falling asleep during this fast paced hands on CPR session, and you can see by the photos the students are not only learning but having a fun time! These dedicated students are working hard, studying intensely and preparing for their new career as dental assistants. We couldn’t be more proud! Dental Assisting is a lot more than just sucking spit!! Dental Assistants are artists! 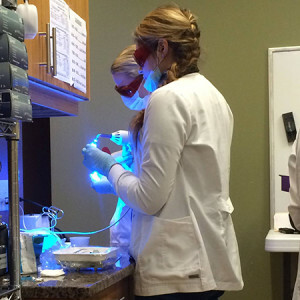 Among the many skills a student will learn is learning to make impressions, grinding and trimming models, then creating custom trays for teeth whitening. They learn to create temporary crowns, sealants and all the while keeping the patient’s best interest at heart! If you have the motivation and desire to change your life, call us now to set up an appointment (360) 433-0788, or email us at: web@dentalassistantportland.com or you can check out our dental assistant google reviews.